Where Do You Rank In LinkedIn’s Search Results? Have you ever wondered where you rank in the search results when other people search for you or people like you in LinkedIn? Have you ever searched for yourself on LinkedIn? Do you know here you rank in the results? From my research and observations, most of what the LinkedIn experts and gurus advise with regard to LinkedIn profile optimization may be wrong. In fact, some of the things people are doing on LinkedIn in an attempt to positively affect their search ranking may have a dramatically opposite effect! 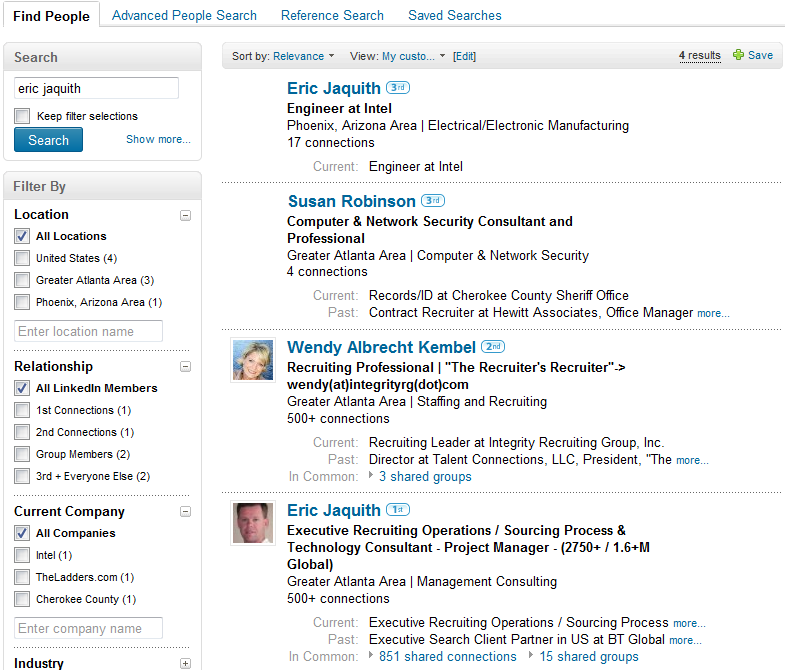 What Happens When You Search for Yourself on LinkedIn? I wasn’t sure exactly what to expect, but something told me I should be #1. Instead, I am the last on the list of results sorted by relevance, after people who aren’t even in my network. None of the profiles, including my own, mention my name more than once. Then I decided I would try searching for my name in the keywords field to see what would happen. The results are the same – I am dead last, and the top 2 results are people who have only 1 connection. The third result isn’t even spelled the exact way I searched for it, and it’s still ranked higher than me. Does this happen to everyone who searches for themselves? Does LinkedIn always rank you last in your own search? 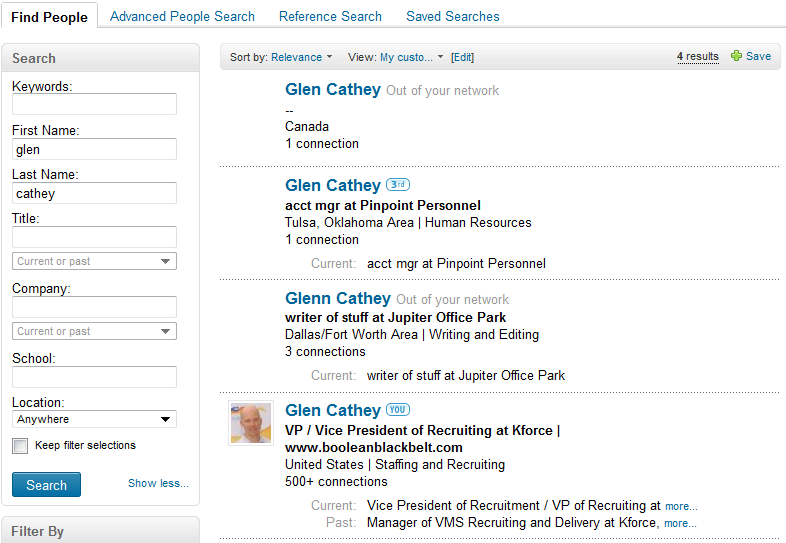 What happens when you search for yourself by first and last name in LinkedIn? Is your experience any different? To get to the bottom of this mystery, I thought I’d try checking into LinkedIn’s searchable customer support center. I’m not sure how many other people have really delved into all that is available there. Surprisingly, it turns out they have an answer to the question of why my profile doesn’t rank at the top of LinkedIn search results. I suggest you read very carefully. You have a unique relevance score determined by LinkedIn which affects search result ranking. What I find especially interesting is that the order of search results is determined in part by the Profile, activity, connections and relevance score of the person conducting the search. Out of the Glen Catheys in LinkedIn, I have the most complete and detailed profile, the most activity, and the most connections. So why am I still ranked last? Am I somehow penalized for having a detailed profile, more activity and a high number of connections? Of course I can’t say for certain, but it’s worth noting that from the search results alone, it appears so. 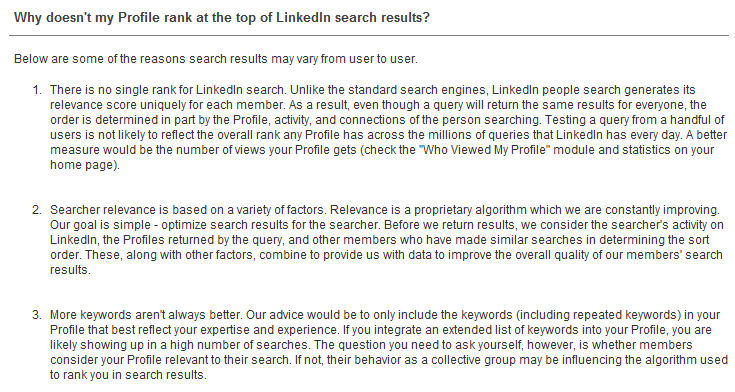 For the many people who think that keyword-loading their LinkedIn profile helps in their search ranking, if you read point #3 above carefully, you’ll see that having an “extended list of keywords in your Profile” will result in your Profile showing up in a high number of searches, and while most people would consider that a good thing, it may not actually be. How can anyone know if their own profile is relevant for anyone who runs a search with words mentioned on their profile? What “behavior” as a group can searchers exhibit to influence LinkedIn’s algorithm that affects where YOU show up in the results? If you have the answers to these questions, please don’t hesitate to let me know! I decided to search for someone I know that I am directly connected to – Eric Jaquith. Using the first name and last name search fields and sorting by the default ranking of “relevance,” somehow the Eric Jaquith I know (the second result) is the second result. Which is especially odd given that I sorted the results by relevance, which, according to LinkedIn, is a mix of keyword relevance and social graph, as he is a 1st degree connection. The #1 ranked result only mentions the name once and he is a 3rd degree connection. Then I decided to search for Eric’s name in the keywords field and sort by relevance. The Eric I know should be first result not only because he is a 1st degree connection, but even more so because his name is also mentioned multiple times in his profile under his company’s name as well as in recommendations. How can a 1st degree connection be ranked last, after two 3rd degree connections (oddly, the #1 and #2 results) and one 2nd degree connection when I am sorting by relevance? Notice that Susan Robinson and Wendy Kembel show up in the results ahead of Eric himself. Again, I must ask – how is this possible? It’s as if the higher keyword frequency of Eric’s name is actually penalizing his search rank. In this case, the #1 result doesn’t mention “Eric Jaquith” as “keywords” anywhere – the name is only mentioned in the name field. He’s a 3rd degree connection with 17 total connections. Susan, the #2 result, mentions his name twice and she is a 3rd degree connection with 4 connections. Wendy, the #3 result, mentions Eric’s name once and she is a 2nd degree connection with 500+ connections. Eric’s own profile mentions his name 4 times, he’s my 1st degree connection, has 500+ connections and he is ranked last. My “sourcing sixth sense” is telling me that some combination of high levels of activity, multiple keyword mentions, and large networks are in fact negatively affecting search rankings – at least to some extent. I just can’t determine if it’s because of my Profile, Eric’s Profile, or a combination of both. If someone searches for YOU, do you know where you rank? Have you tried to optimize your LinkedIn profile for optimum ranking? From what I have demonstrated in this post, you may not show up in the results where you expect to be, and if your name isn’t as uncommon as mine or Eric’s, you may not even be on the first page of results. I’m curious to know what happens when you search for yourself on LinkedIn, what happens when you have friends search for you, and if you have any insight into LinkedIn search ranking. Tags:How to rank highly in LinkedIn search results, LinkedIn Expert, LinkedIn Profile Search Optimization, LinkedIn Search Rank, LinkedIn Search Ranking, LinkedIn Search Results, LinkedIn SEO, LinkedIn Training, Where do I rank on LinkedIn?